2012-09-26 The EAPLS 2012 GPCE/SLE Best Paper Award was given to Ferruccio Damiani, Luca Padovani, and Ina Schaefer for their GPCE'12 paper A Formal Foundation for Dynamic Delta-Oriented Software Product Lines. 2012-09-25 The GPCE'12 conference proceedings are available in the ACM Digital Library. 2012-08-08 The GPCE'12 conference program is available. Generative and component approaches are revolutionizing software development just as automation and componentization revolutionized manufacturing. Key technologies for automating program development are Generative Programming for program synthesis, Component Engineering for modularity, and Domain-Specific Languages (DSLs) for compact problem-oriented programming notations. The International Conference on Generative Programming and Component Engineering is a venue for researchers and practitioners interested in techniques that use program generation and component deployment to increase programmer productivity, improve software quality, and shorten the time-to-market of software products. In addition to exploring cutting-edge techniques of generative and component-based software, our goal is to foster further cross-fertilization between the software engineering and the programming languages research communities. 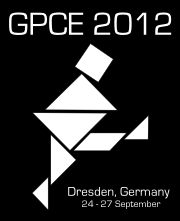 GPCE'12 will be held in Dresden, Germany. The conference will be collocated with the Fifth International Conference of Software Language Engineering (SLE'12) and with the Fourth International Workshop on Feature-Oriented Software Development (FOSD'12). Read more in the GPCE'12 Call for Papers (HTML).